MOC2-543f: "Flyover Movie (2.1 MBytes)"
NOTE: "Movie" may not work with some older viewing software. Mars Global Surveyor (MGS) has been operating in Mars orbit longer than any other spacecraft. The Mars Orbiter Camera (MOC) began taking pictures in September 1997, shortly after MGS arrived. Since that time, it has only imaged about 3% of the martian surface with its high resolution (1.5 to 12 meters, 5 to 40 feet, per pixel), narrow angle (NA) camera system. Thus, an important discovery from MOC can--and does--come at any time, even five and six years into the mission. This week, the journal Science has published online (in Science Express) the most recent MOC discovery: an ancient, eroded, and exhumed sedimentary distributary fan located in a crater at 24.3°S, 33.5°W. A distributary fan is a generic term used by geologists to describe a family of deposits that includes river deltas and alluvial fans. 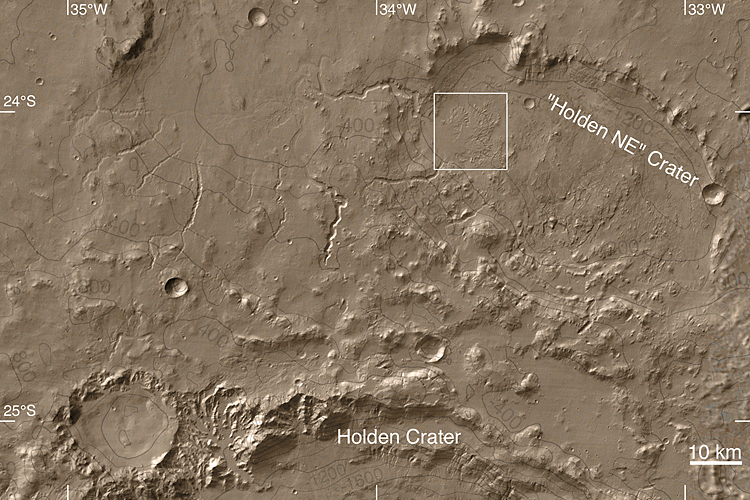 Sometime in the distant past, when it was still possible for liquid water to flow across the martian surface, sediments transported through valleys by water formed a fan-shaped deposit in a 64-kilometer (40 miles) -diameter crater northeast of Holden Crater. What is important about this discovery? First, it provides clear, unequivocal evidence that some valleys on Mars experienced the same type of on-going, or, persistent, flow over long periods of time as rivers do on Earth. 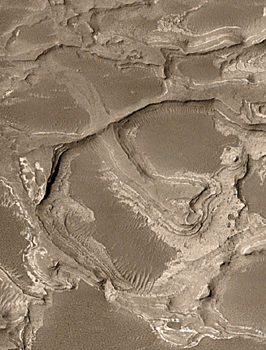 Second, because the fan is today a deposit of sedimentary rock, it demonstrates that some sedimentary rocks on Mars were, as has been suspected but never clearly demonstrated, deposited in a liquid (probably water) environment. Third, the general shape, pattern of its channels, and low topographic slopes provide circumstantial evidence that the feature was actually a delta--that is, a deposit made when a river or stream enters a body of water. In other words, the landform discovered by MOC may be the strongest indicator yet that some craters and other depressions on Mars once held lakes. Although hundreds of other locations on Mars where valleys enter craters and basins have been imaged by MOC, this is the first to show landforms like those presented here. The first picture, MOC2-543a, is a mosaic of MOC high resolution images acquired between August 2000 and September 2003. The area covered is 14 km (8.7 mi) wide and 19.3 km (12 mi) high; north is up and the scene is illuminated by sunlight from the left. The MOC NA camera takes grayscale images; the color added to this and the other images was derived from data collected nearby using the Thermal Emission Imaging System (THEMIS) Visible Imaging Subsystem (built by Malin Space Science Systems for Arizona State University) on-board the Mars Odyssey spacecraft. The picture shows the entire distributary fan. The fan is a fossil landform--that is, it is an eroded remnant of a somewhat larger, somewhat thicker deposit. The originally loose sediment has been turned to rock and then eroded over time to present the features seen today. The channels through which sediment was transported are no longer present; instead, only their floors have remained, and these have been elevated by erosion so that former channels now stand as ridges. The floors of former channels became inverted because they were more resistant to the forces of erosion---either they were more strongly cemented than the surrounding materials, or they have more coarse grains (which are harder to remove), or both. The second picture, MOC2-543b, shows the same mosaic, with the locations of MOC2-543c and MOC2-543d indicated by white boxes. The third image, MOC2-543c, shows a critical observation: the loop at the center of the picture is the inverted form of a former meandering stream that was cut off as the channel adjusted its course. 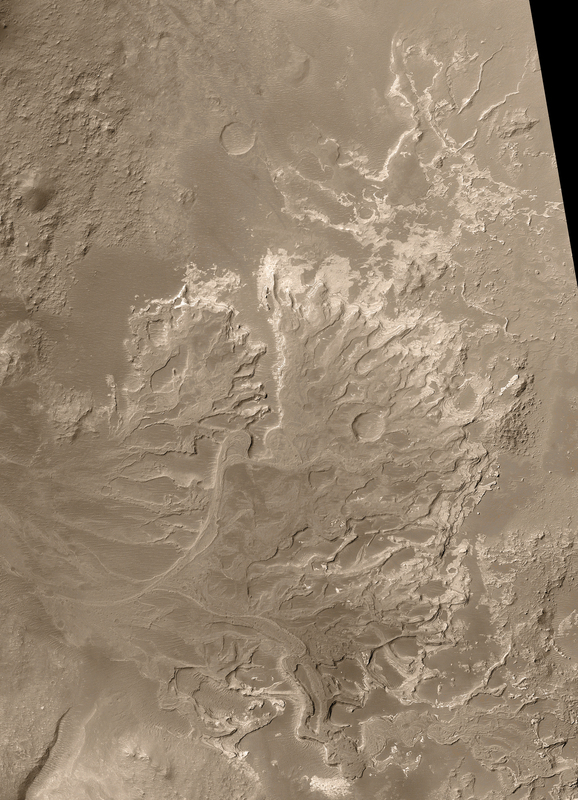 Meanders and cut-off meanders are the prime evidence for on-going, persistent flow of water through this area some time early in martian history. 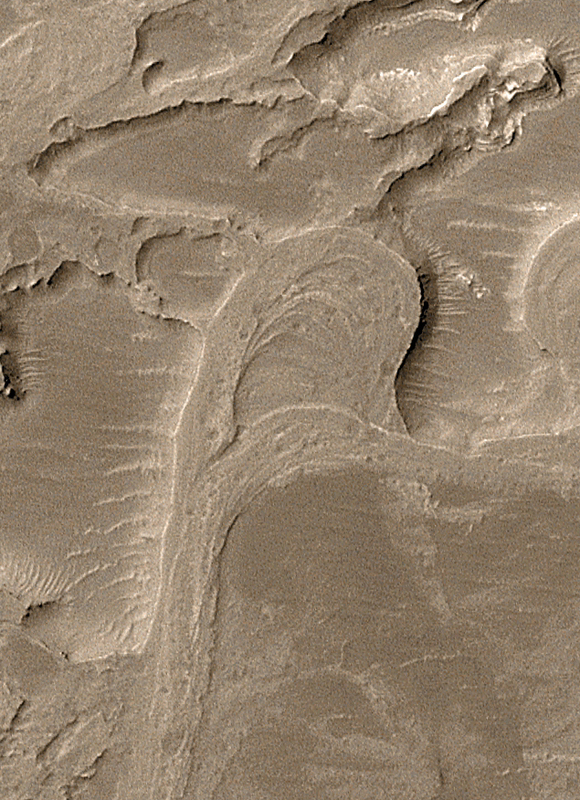 The fourth image, MOC2-543d, shows another critical observation, that of inverted channels at different levels within the sedimentary deposit, also indicating a long and complex history of water-related processes. One ridge crosses over another just left of the center of this frame. The top of the lower ridge is the former floor of a channel that was transporting water and sediment toward the lower right. The top of the upper ridge was once the floor of a channel that moved material toward the right/upper right. The lower ridge is the older channel; it was completely filled and buried beneath the surface when the upper channel formed. The fifth picture is a map showing the location of the distributary fan. It is at the west end of a ~64 km (~40 mi) wide crater ("Holden NE" Crater) northeast of the much larger, Holden Crater. The white box indicates the location of the fan. To the west of the fan are several valleys that fed water and sediment to the "Holden NE" Crater. This map is a mosaic of Mars Odyssey daytime thermal infrared images released by the THEMIS team. 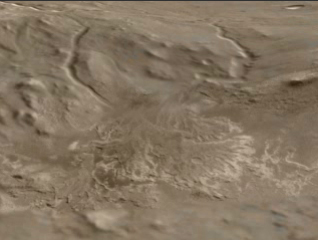 The contours are topography, relative to the martian datum (the elevation 0 contour) derived from observations acquired by the MGS Mars Orbiter Laser Altimeter (MOLA) experiment. Sunlight illuminates the mosaic from the upper left, and the 10 kilometers scale bar is about 6.2 miles across. The sixth picture (MOC2-543f) is a short "movie" (.mov file) simulating a fly-around, followed by a birds-eye view, of the fan in the crater northeast of Holden Crater. The fly-over combines all of the spacecraft data sets described previously: MGS MOC images, Mars Odyssey THEMIS images, and MGS MOLA topography. The MGS MOC continues to return new pictures every day, and will provide critical support to the Mars Exploration Rover (MER) mission beginning in January 2004. Together with the MGS Mars Relay (MR) system, MOC will provide near-realtime coverage of engineering telemetry during the critical entry, descent, and landing (EDL) of both MER-A ("Spirit") and MER-B ("Opportunity"). After landing, MOC/MR will relay rover science data from the surface of Mars back to Earth, while simultaneously continuing its on-going science investigations, in particular searching for further evidence of the environmental conditions both in early martian history and more recently. Given the results to date, exciting, unexpected discoveries are certain to follow.